I choose to exercise my status as an apex predator. And I laugh in the face of cholesterol. In the beginning of September, my professor suggested I read this. Strangely, I can't remember why or how this came up, but it has been on the 'to read' list for four months, and I finally picked it up over christmas break. 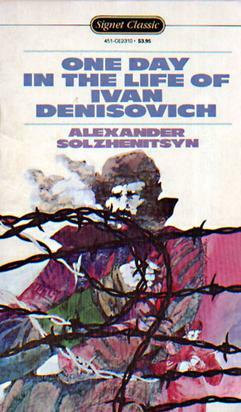 Solzhenitsyn's "One Day in the Life of Ivan Denisovich" is considered a landmark book in 20th century literature because it is one of the first (the first?) books to depict the harsh (inhumane) conditions of the Soviet Gulag, opening up an entire world to the masses of both Soviet Russia and the rest of the world in 1962. The book is a scant 139 pages as a small paperback (Signet Classic, translated by Ralph Parker), and I read it in 3 short sittings. It is truly a breeze to read. The book is quite simply exactly as it states, one day, from waking to sleeping, in the life of a soviet inmate in central Siberia. There's really not much of a story to it, it's more of an account. We live with Ivan Denisovich Shukhov (Shukhov is how he is referred to most often), breathe with him, eat his 9 ounces of bread for breakfast and his 'water stew' with 'bits of fish bones' for dinner. Lay blocks at a power station site in the below zero chill of Siberia with him and plot with him on how to get each and every extra morsel of food. It's an account of survival in the harshest of conditions. Most of Shukhov's thoughts are concerned with food, how to get more of it, get the most out of it, and survive yet another day. The main thing today was that the oatmeal was good—real oatmeal, the best sort. It wasn't often they had it. More often they got magara twice a day. But real oatmeal is filing, it's good. How often had Shukhov in his youth fed oats to horses! Never had it occurred to him that there'd come a time when his whole soul would yearn for a handful of them. The character himself, Ivan Denisovich, is presented to us as a real down-to-earth, folky character. A man who believes in doing a job right, he shows throughout the novel the incredible resourcefulness of many of the gulag prisoners. Occasionally the narrator would address the reader directly, "you would consider it too, if you were in that position." At first this style of writing threw me off, but I got used to it, even more drawn in. Solzhenitsyn clearly wants more than for us to read his account of gulag life (the author himself was imprisoned for 8 years, and then sent into 'interior-exile' in Kazakhstan), he wants you to take part in it, imagining yourself in the shoes of these prisoners and how you would survive what is for the most part a hopeless, remorseless situation. Alyosha heard Shukhov's whispered prayer, and turning to him: "There you are, Ivan Denisovich, your soul is begging to pray. Why don't you give it its freedom?" Shukhov stole a look at him. Alyosha's eyes glowed like two candles. "Well, Alyosha," he said with a sigh, "it's this way. Prayers are like those appeals of ours. Either they don't get through or they're returned with 'rejected' scrawled across 'em." Overall it is an exceptional work and well worth the few hours it takes to read.